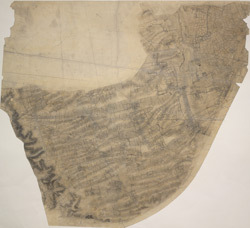 This rough field sketch of the Kentish coastline was produced on about 12 pieces of thin, irregularly cut, paper which were then joined and laid on thick paper. There is considerable mismatch of detail at the joins. The plan runs from the Strait of Dover, through Dover Castle, St Margaret's Bay, Kingsdown, Walmer Castle and Deal. The red colouring normally used to distinguish buildings in settlement areas was not added to this drawing.